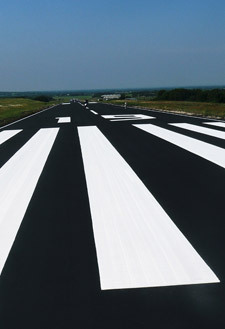 Midway Sealcoating and Striping concentrates on high-quality, commercial asphalt striping and sealcoating. We work across the state of Texas, including the Arlington, Fort Worth, and Dallas area. The smooth, even surface of sealed pavement makes sweeping, snow removal, and maintenance simpler and cheaper. Attractive, slate-black appearance restores original color to asphalt and dries to an even-textured finish. The sun's actinic rays harden and dry out the asphalt surface. This accelerates raveling, erosion, and can reduce asphalt thickness by as much as half in just 5 years. Only coal tar sealer protects asphalt against the highly damaging effects of gas and oil seepage and all other road chemicals, especially aikalis and winter salt. Please be sure to visit our Asphalt Striping Gallery to see our quality work come alive. If you find a service you need, don't hesitate to Contact Midway Sealcoating & Striping. Looking for expert sealcoating and asphalt striping services? Look no further. Please call us at 817.467.7003 or fax your requests to 817.465.1665 to reach a member of our team. Our coverage area spans throughout Eastern Texas. Including, but not limited to, Arlington, Dallas, Fort Worth, Grapevine, Irving, Grand Prairie & Euless.